Inventor Robert Augustus Chesebrough called his Vaseline a "wonder jelly." Since its introduction in the mid-1800s, people have used Vaseline -- or petroleum jelly -- for everything from shining shoes to unsticking gum from desks. As a lotion, this versatile goop forms a barrier on the skin, helping it retain moisture and ward off bacteria. 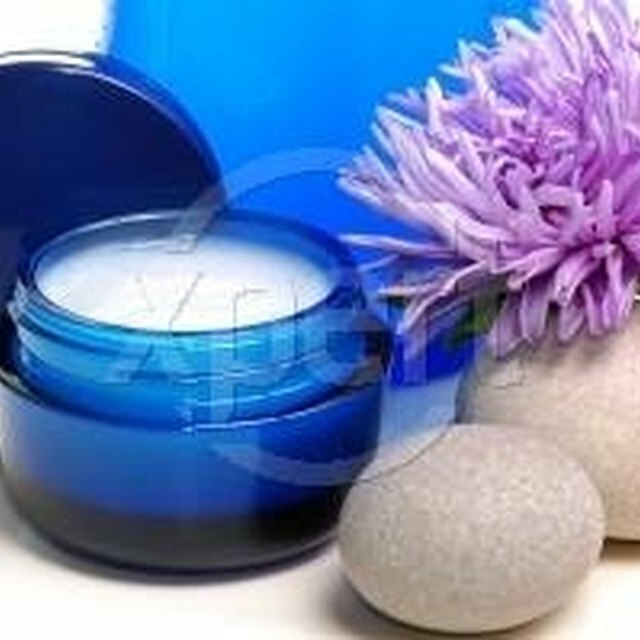 For a heavy-duty, DIY moisturizer, pair Vaseline with beeswax, which also creates a barrier effect. Unlike other moisturizers, beeswax and petroleum jelly don't contain fragrances, so they're less likely to irritate sensitive skin. Heat a double boiler and combine equal parts Vaseline or generic petroleum jelly and beeswax. While petroleum jelly firms the skin, beeswax serves as a thickening agent, encourages skin cell turnover, and has antibacterial and humectant properties. Stir the beeswax and Vaseline gently with a metal spoon as they slowly melt together. Add glycerin, for consistency, as well as almond oil and honey in equal parts to the jelly and beeswax. Almond oil softens the skin and offers skin-bolstering protein, while honey moisturizes. Continue stirring and add a bit of pollen and liquid lecithin to the mix; use about 1 spoonful of pollen and 2 spoons of lecithin per 1/4 cup of the other ingredients. Lecithin emulsifies and moisturizes, while pollen nourishes the skin with protein, minerals and vitamin C. Stir, in total, for about 4 or 5 minutes until the mixture is smooth, then allow it to cool and store it in a sealed container. For fragrance, simply mix in a few drops of the essential oil of your choice. Though smooth, the consistency of this homemade lotion will be a bit thicker than that of most store-bought varieties, almost like a very slick and smooth cake frosting. For a thinner consistency, slowly add more glycerin or cut in a few spoonfuls of olive oil until you reach the desired texture. This lotion may harden over time; reheat and re-stir on a double boiler to return it to its softened form. You can find beeswax, pollen and liquid lecithin at brick-and-mortar and online heath food or supplement stores, or, in the case of the former, at candlemaking suppliers. Apply your homemade petroleum jelly lotion while your skin is still damp from washing. This helps the jelly seal in moisture more effectively. To make a simple exfoliating scrub, combine Vaseline with brown sugar. You can also cut some petro jelly into your store-bought lotion if you're running low. Don't use a regular pot or pan for this DIY recipe, as beeswax is flammable -- stick with a double boiler to stay safe. The Telegraph: A Cure for All Your Ills?